Please see Terms and Conditions below for full details. Luxury and comfort are the defining factors when travelling. If you are looking to travel in style but at a discounted rate, look no further. A plethora of attractive deals and promotions sided with the service from one of the world’s best airlines. Not only an icon in the aviation industry but it is also a beacon of excellence when it comes to air travel. On 1st May 1947, the first flight of Malayan Airways Limited flew from Singapore’s Kallang Airport to Ipoh, Kuala Lumpur and Penang in Malaysia. The airline rebranded in 1967, from the former to Malaysia Singapore Airlines after the governments of both countries acquired a joint stake in the company. In 1972, following a difference in management both countries decided to have separate airlines which were called Singapore Airlines (SIA) and Malaysian Airline Systems. When Singapore Airlines first started, it operated differently than most of the other airlines in the world. This was because SIA had no domestic routes to fly and thus, it had no option but to fly to international destinations. This also meant that SIA had to compete with the international airlines of the world. It was not very easy for the airline as it was competing with the major airlines in the world. SQ was chosen by the airline when it was establishing itself as one of the leading airlines in the world. The abbreviation for Superior Quality, the airline has undoubtedly lived up to its name for providing one of the best aviation services in the world. In 1981 Singapore Airlines relocated to the present Changi Airport and in 1995, it launched their inflight entertainment system, KrisWorld. SIA flies to 32 countries today and more than 60 cities. The airline’s full fleet includes Airbus 350, Airbus 330, Boeing 777 and Airbus 380. There are five travel classes available on the SIA. Travellers can choose the class which suits their travel needs the most. Suites: These are only available on only one of the aircrafts from the fleet of SIA i.e. the Airbus 380-800 which flies to Sydney, Paris, London etc. Your personal space is of top priority when travelling in the Suites. Each cabin has window blinds and a sliding door to ensure maximum privacy even when 30,000 feet above the ground. Apart from the other amenities, the Suites have a bed and a separate seat ensuring complete comfort. First Class: The first class of Singapore Airlines is luxury redefined. The travellers enjoy complete comfort with the spacious seats and large flat beds. Business Class: The business class of SIA is perfect for the business traveller who needs good rest so that they are ready and fresh to work as soon as they land. Exceptional food and flat beds are few of the amenities you enjoy when you fly business class. Premium Economy Class: The seats in the premium economy are wider and thus, more comfortable. There is enough leg space and with the award winning services and other privileges, premium economy is perfect choice for the traveller who does not want to compromise on comfort keeping the pocket in mind. Economy Class: The economy class of SIA gives more space to its passengers. There is more legroom in the seats and there is also a choice to choose seats with extra leg room. The chefs at Singapore Airlines take a lot of pleasure to ensure the best food is available to the travelers. It is a known fact that cabin pressure can change the taste the food. The dishes are prepared and served in a simulated cabin pressure and flavours are adequately changed to ensure the best food is served during travel. The best wines were also carefully chosen from over 1,000 selections. Special meals can be also requested for depending on your dietary requirements. KrisWorld is Singapore Airlines’ inflight travel system which has more than 1000 movies, music, TV programmes and games. Keeps the young travellers adequately entertained, and amazing for the adults too. Singapore Airlines has one of the best frequent flyer programmes. Every time a member flies with SIA or SIA-affiliated airlines, they earn KrisFlyer miles. Miles can also be earned when booking hotels, cars or even when using designated credit card(s). They are three membership tiers, namely, KrisFlyer, KrisFlyer Elite Silver and KrisFlyer Elite Gold, and each tier is attained as you travel more with the airline. 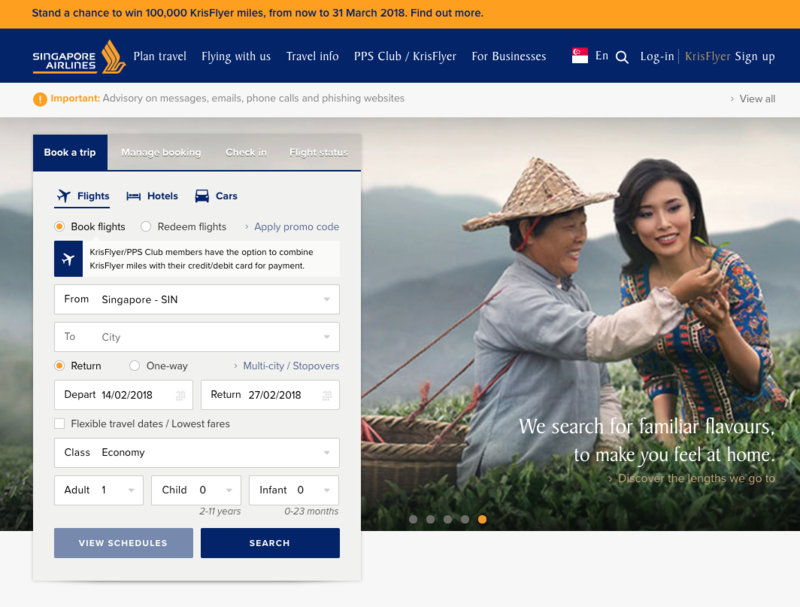 Booking flights on Singapore Airlines website is simple. All that you need to do is to enter details of origin city and the city you are travelling to, the date of travel and the class. Once the site gives the options you can go ahead and book. Members of the KrisFlyer club have the option to pay using points or a combination of an amount on the credit or debit card and miles, if miles are not sufficient. Fare Deals: Irregardless of the reason of travel, special fares are offered to different destinations across the world, which helps the travellers save money on the fly. KrisFlyer Promotions: All the KrisFlyer members can entitled to various promotions across different hotels, resorts and other service partners. While using the services from these partners, the member stands a chance to earn more reward points or miles which can be redeemed later. 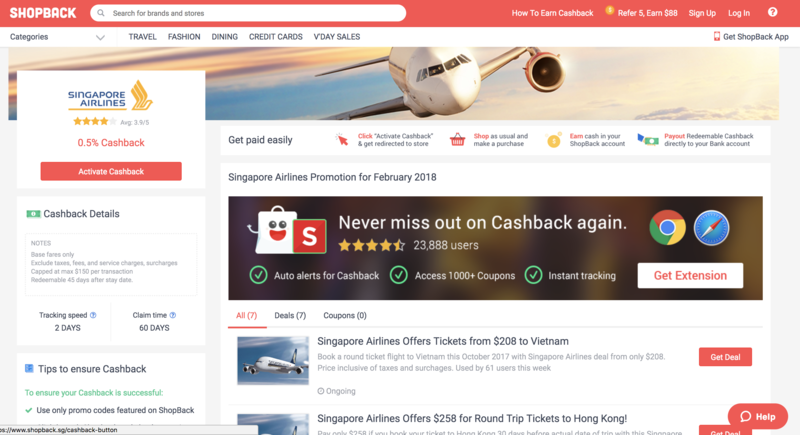 Hotels: Singapore Airlines has partnered with Agoda, which connects great accommodations across the globe with customers at competitive price points. KrisFlyer members can also earn 2 miles for spending every 1 USD on the website. Car Rentals: From the Singapore Airline website you can book your car rentals through rentalcars.com. SIA helps its travellers manage their booking easily from their website and also provide another avenue to earn KrisFlyer points. Add ons: SIA helps get its clients travel deals from Tradewinds Tours and Travels. KrisFlyer members can also earn points when they book local experiences all over the world on Viator and Conxxe Airport Transfers. Packages: The airline offers travel packages which completes the holiday experience better with even better deals. Free Singapore Tour: If the transit time in Singapore is more than 5.5 hours, a free heritage tour is offered to the travelers. The City Sights Tour is also an option if the transit time is more than 6 hours. Boarding Pass Privileges: Upon presenting the boarding pass, travellers are entitled to amazing offers at participating service providers and outlets within one month of travel date. Singapore Airlines offers various deals and promotions from time to time to provide a better experience to travellers at cheaper rates. Many Singapore airlines promotions and deals are offered from time to time so that their clients can get the best services at the most economical price. Most of the promotions offered by Singapore Airlines are available on the website and you can easily find them. One such example is the Early Bird Fares: SIA rewards its travellers to plan and book early. Fares as low as $158 (all in return) fares to 55 exotic and beautiful destinations worldwide are available for grabs. So if you can plan your vacation or trip well in advance, you can expect to book those trips at a cheaper rate. There are also various promo codes available from time to time which can be used to further reduce the discount. Keep your eyes peeled for the various deals on Singapore airlines’ website. Similarly, check out Shopback for discounts and cashback from your air ticket purchases! If you are looking to save even more, check out the Singapore airlines’ page on ShopBack. 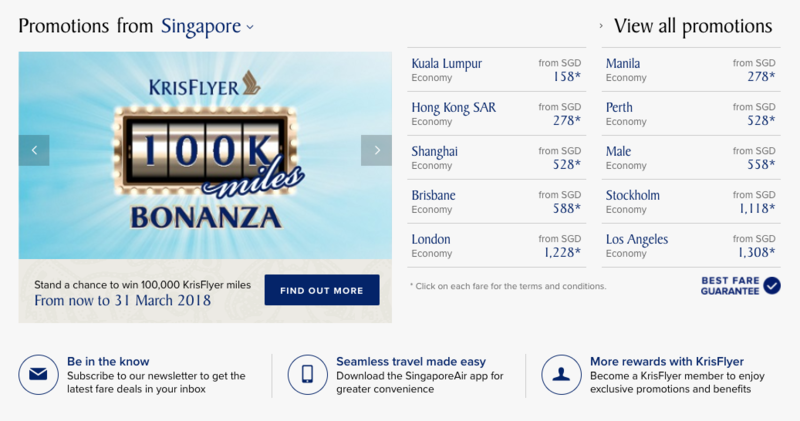 There are different deals and Singapore airlines promotions available which will help you get cheaper fares or earn more KrisFlyer miles. The savings and discounts are available as cash back. For example, a cash back of 0.5% is offered on Singapore Airlines. The airline allows you to cancel your airline ticket and get a refund if a refundable ticket has been booked. Only the taxes will be refunded, if a non-refundable ticket is cancelled. The amount of refund is credited to the card used to book the ticket. There can be some cases where a cancellation or a refund fee will be levied. All tickets have a deadline within which you can cancel your booking and thus, you must cancel the booking within this time frame. If you’re within a week of the travel date and a ticket was booked from or to USA, you can cancel the same without any charges within 24 hours of the booking. The cancellation must be done at the local Singapore Airline office to get a full refund. The airline has offices in most of the cities and one can contact the local office using the numbers listed. The airline can also be contacted through social media from where all deals and promotions can also be read and understood. All you need to do is log in to these social media pages and get all the help that you need.